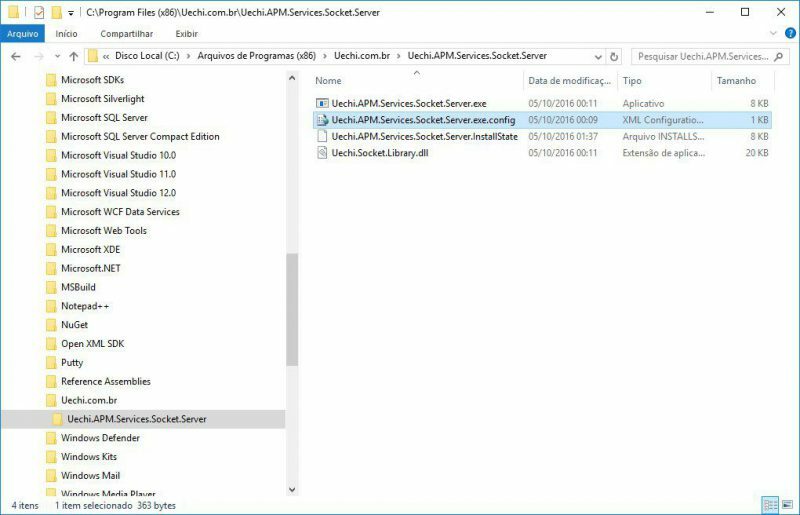 Uechi APM Web is an APM (Application Performance Management) Open Source Server Performance Monitor written and developed in Java and C # for all Linux and Windows platforms. 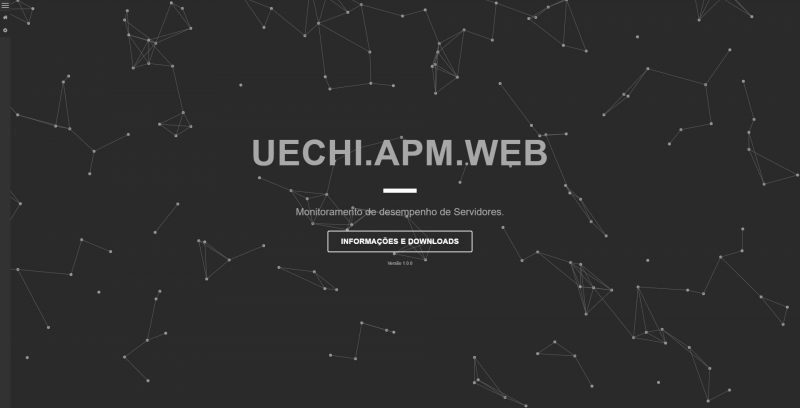 The Uechi.APM.Web offers a complete resource for unlimited monitoring servers in real time. Have full control of the CPU consumption, memory, disk and network traffic. Communication is done via TCP Protocol Socket connection. See a simulated demonstration by clicking here or visit http://vm.uechi.com.br/Uechi.APM.Web/ address. Through a Front developed in Web, allows easy configuration for monitoring an unlimited number of servers in real time, still relying on visual alerts monitoring. The communication is done via the TCP socket. Below is an example Monitor Dashboard with two warnings, a medium and a serious warning highlighted by yellow and red colors. 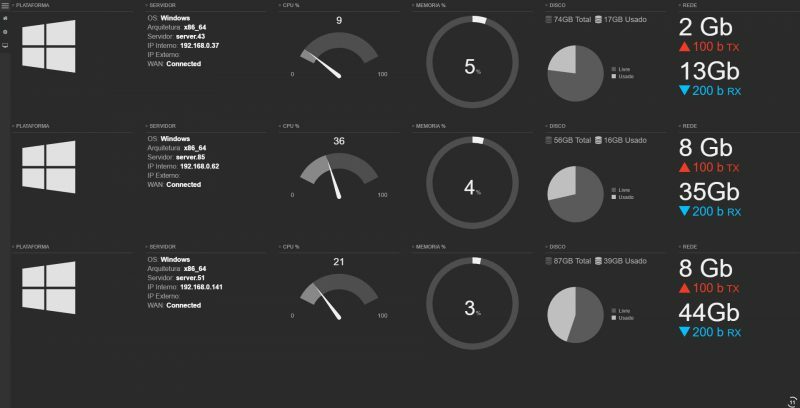 The Monitor Dashboard updates every “x” seconds based on your parameter setting. The service is compatible for both Linux and Windows 32bit and 64Bit platforms. All features are available in the demo simulated operating in http://vm.uechi.com.br/Uechi.APM.Web/ address. 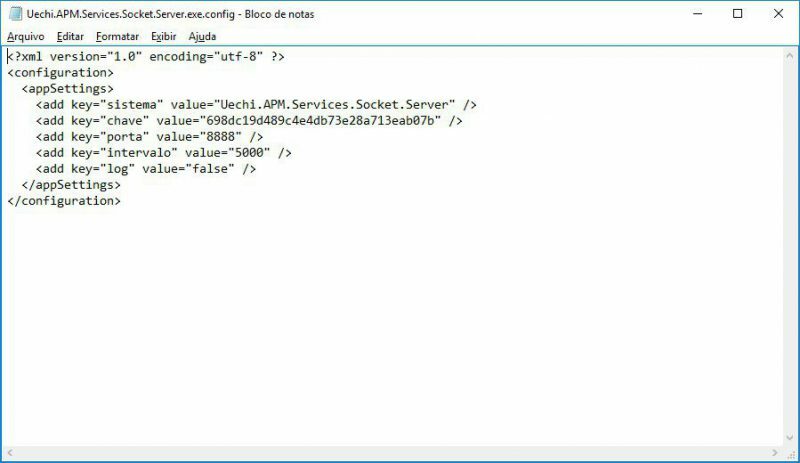 Communicates with the server through socket with TCP making an authenticated request by a Hash Key Encrypted MD5 and requested option, Uechi.APM.Service.Socket.Server makes validation and consultation request requested from the server returning the information to the Uechi.APM.Web. 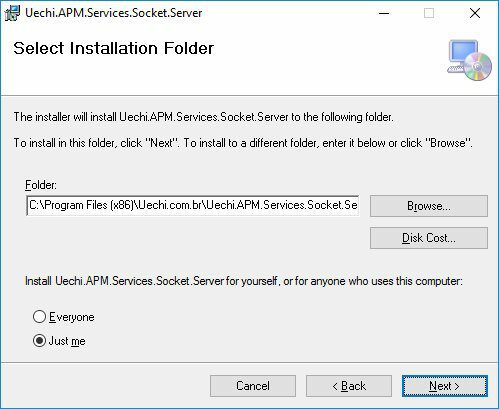 The configuration of Uechi.APM.Web and made by custom parameters such as time, amount of display servers screen, better resolution setting. The design is responsive, thus be viewed in different types of resolution to other devices such as tablets and phones. The security key settings must be made through a Hash Key Encryption with MD5 128 bits of your choice, then following the communication port and the servers will be done communication, separated by ‘,’ comma. You also has a medium-warning alerts configuration severe being distinguished by yellow and red colors, which can be configured according to your CPU consumption suggestion, Memory, Disk and Network traffic. 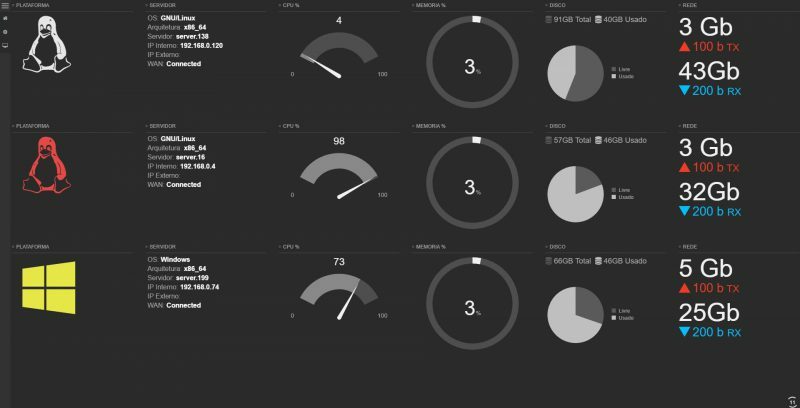 Linux version is a Client Open Source server performance monitor for Linux, which responds to requests made by Uechi.APM.Web. 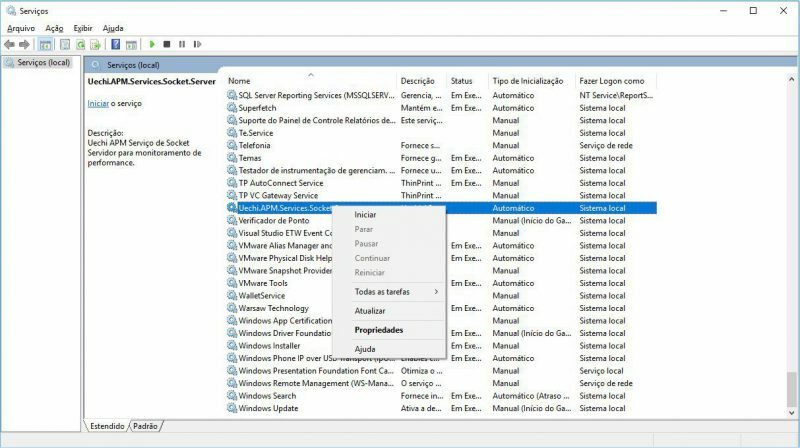 Windows version is a Client Open Source server performance monitor for Windows, which responds to requests made by Uechi.APM.Web. Monitoring Web project developed in JSP on the Java platform 1.8 and 1.7 compatible, running on Glassfish Web 4.0 and Tomcat 8.0 server. Customer Service Project Socket in Java 1.8 compatible with Linux platforms. 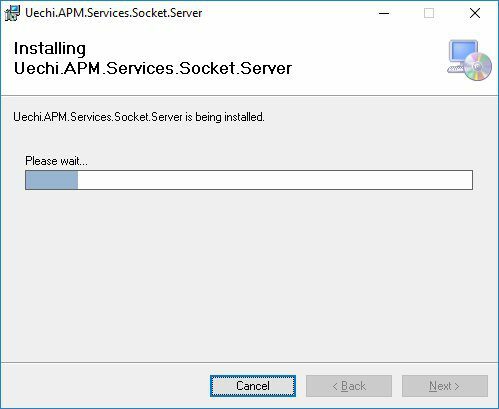 Customer Service Project Socket developed in VS.NET Framework 4.0 supports Windows platforms. 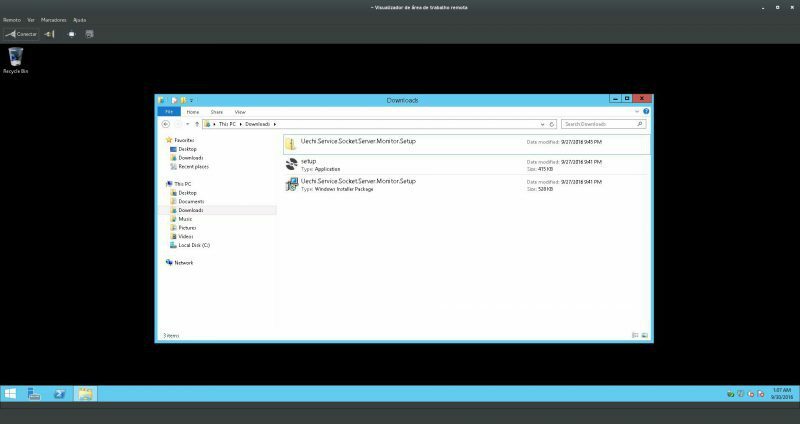 Operating Windows versions Server system. 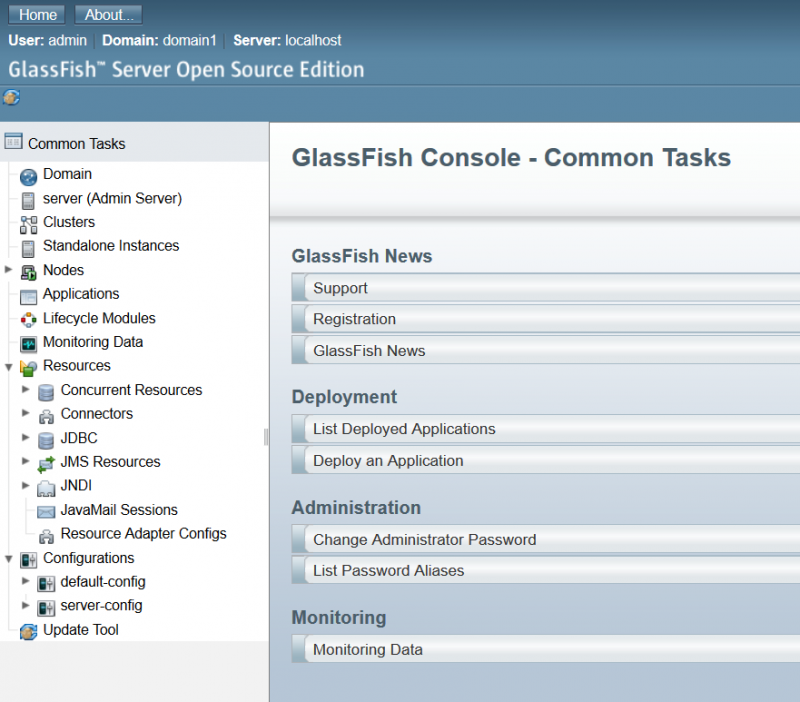 Note: I’ll use the example of Glassfish, if not installed click here. 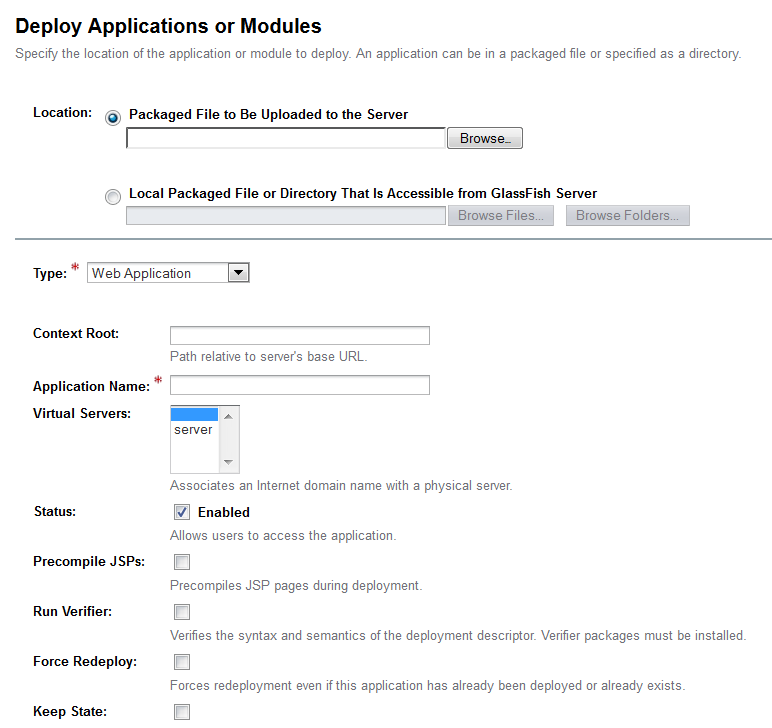 b) Access Admin your Glassfish, Applications menu, then click the Deploy button. c) Click to locate the .war file after selected click OK.
## NOTE: Replace the "User" by default user where your GlassFish / Tomcat runs. f) Edit the file parameters “key = 698dc19d489c4e4db73e28a713eab07b” and “Port = 8888” to your desired setting. 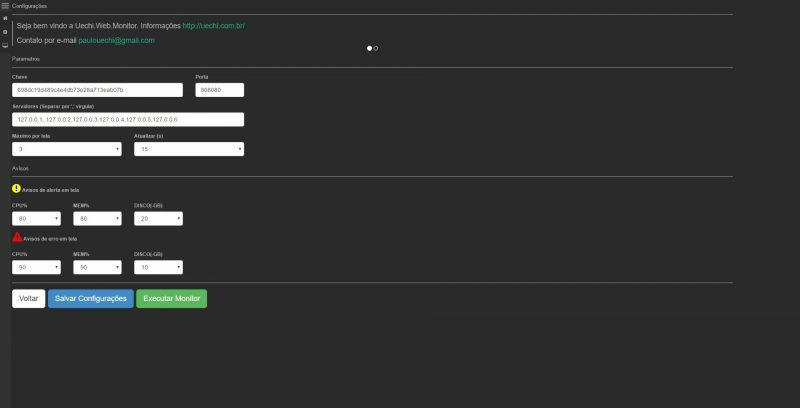 Notes: To generate a new Key MD5 please visit http://passwordsgenerator.net/md5-hash-generator/ enter your desired combination to generate a new key. 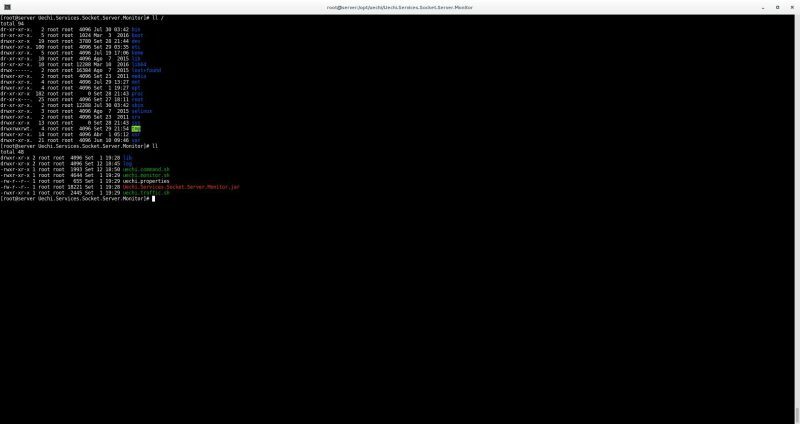 b) Extract the ZIP aquivo for Setup.exe and the MSI. 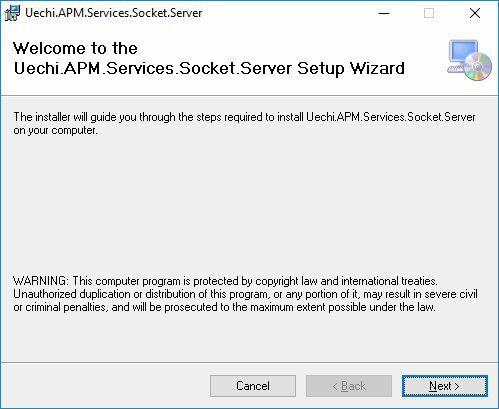 d) After the installation is complete, go in the Administrative Tools of Windows and click the Services icon, locate the Uechi.APM.Services.Socket.Server click the right button and click start. Note: The Service will start automatically if the server is rebooted. 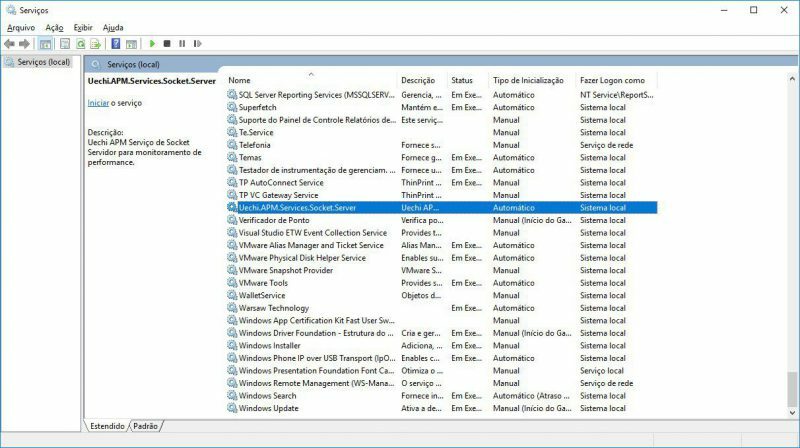 Save the file and restart the service as step d.
This project was started by the need for a quick simple basic monitoring and target servers. The future idea is to store the information obtained and present a performance history of the monitored servers and in the future maybe even applications. Camila Nachbar – Camila blog go here or contact by email camila.nachbar@gmail.com. I thank everyone who is interested to contribute and improve the project. If you are interested in participating, please download the project and make the necessary implementations. After contact by email, in the case of new versions, we can combine releases of projects. 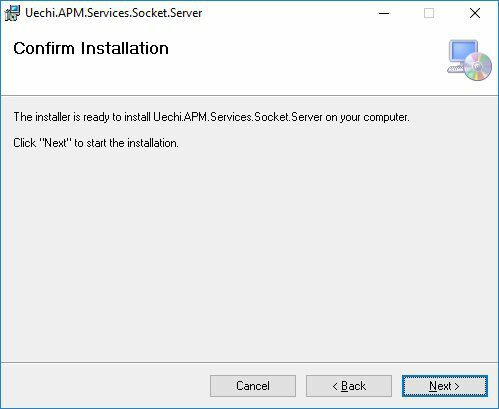 Uechi.APM.Web and Uechi.APM.Services.Socket.Server Windows and Linux versions are licensed under the Apache License, Version 2.0. See LICENSE for complete license information. 2 – Enhance details of the data on screen. 3 – Encrypt all communication. Questions or suggestions please or make requests in the comments below or contact by email paulouechi@gmail.com.